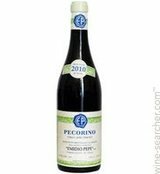 A wine that expresses itself in a complete different way than the Trebbiano, the Pecorino seems to be immediate and flavorful with an important structure and a strong acidity. A fragrant, creamy white, with peach skin, chamomile and smoke notes layered with crushed almond and blood orange peel flavors. Distinctive and medium-bodied, this is sleek and expressive, expanding on the palate to the long, chiseled finish. Drink now through 2028. 458 cases made.